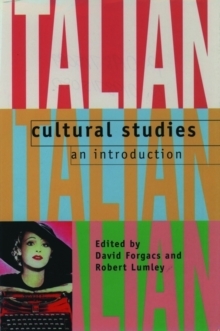 This is an up-to-date, illustrated introduction to the study of modern Italian culture containing nineteen chapters by specialists in the field of language, politics, religious, ethnic, and gender identities, the mass media, cultural policy, and stars. Adopting a unique and accessible interdisciplinary focus, Italian Cultural Studies: An Introduction presents a variety of new perspectives on modern Italian culture. Each of the four parts explore diverse aspects of culture in Italy. 'Geographies' questions received notions of the Italian nation, the family, the 'South' and corruption; it also looks at anthropological approaches to culture and at Italy's linguistic pluralism. 'Identities' examines gender, religion, politics, and ethnicity as a means with which people define themselves and others. 'Media' explores the press, literature, television, and cinema. 'Culture and Society' brings together historical analyses of cultural policy, stars and style, and popular music. Each part is followed by sample analyses of visual materials and includes guidance in further reading. Achronology of political and cultural events since 1900 is also provided. Drawing on the expertise of leading authorities Italian Cultural Studies will be essential reading for anyone interested in modern Italy and its culture.